Today I went to the Folkster kilo sale which was held in Smithfield. As I live nearby getting up early wasn’t too much of a challenge! I’m the type of person who could sleep 15 hours a day so it has to be a special event for me to be up early. Last year I missed most of the sale as I was hung over …this year I’m off the sauce for November so no excuses! I arrived bright and early at 7.45 a.m. and already people were queuing up to get the tickets. I came back at 11.30 to queue inside in the individual zones and at 12 the floodgates opened! It was full on chaos as girls (and a few boys) ran like rabid dogs towards rails of vintage goodies! The items literally flew off the rails as anxious shoppers grabbed what they could. There were 8 zones with 100 people in each so you can imagine the madness! The queues for the fitting rooms were long but I wanted to try on things properly to be sure I liked them. It’s too tempting just to grab things at a kilo sale and hope for the best but it’s not a good idea! I was hoping to find a checked shirt but these were in high demand! I tried on a men’s one but it was absolutely huge on me. 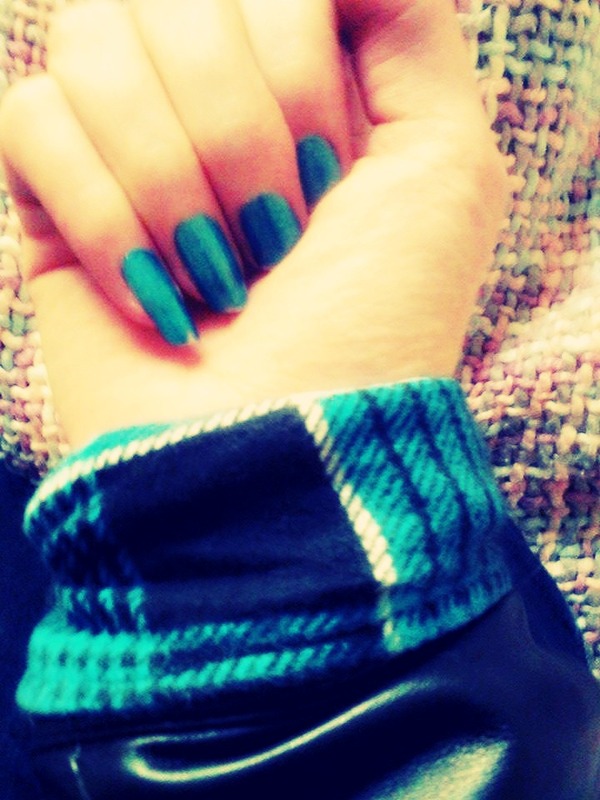 But I had a stroke of luck when I found this lovely blue flannel checked shirt. I had already left the fitting room so this is where bringing a friend came in handy! Having no mirror I relied on my friend’s advice. 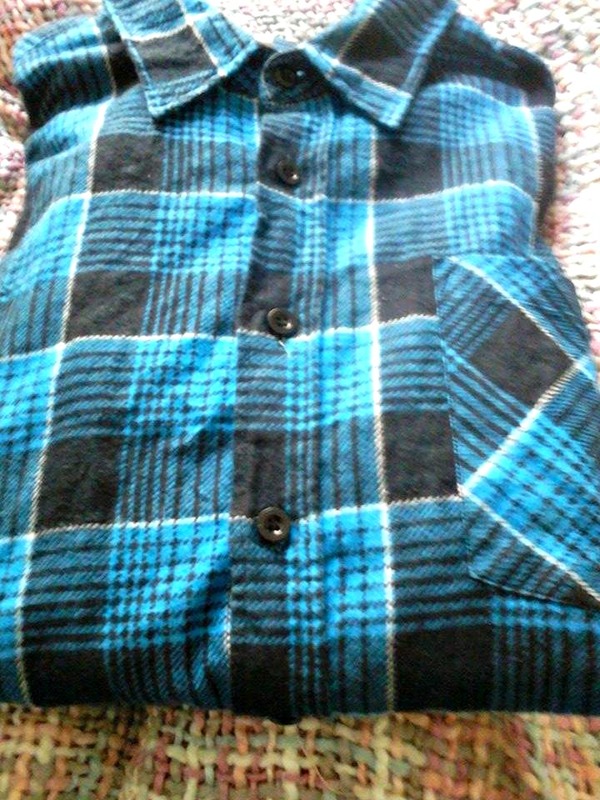 It felt very ironic buying a lumberjack shirt like those my brothers wore all their teenage lives! But I fell in love with it and it looked great under a leather jacket with the cuffs rolled up. I’m going to wear this on its own with shorts, black tights and brogues or with leggings or a leather jacket and jeans. I think it’s a really versatile piece. 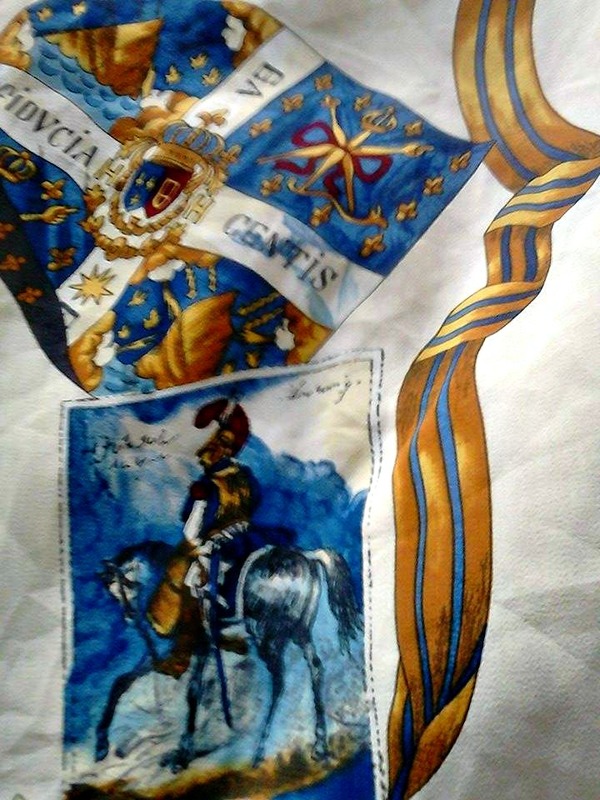 I also picked out this shirt, the scarf print design caught my eye. I initially wasn’t sure the short sleeves but when I tried it on it was really cute.The pattern on the back of the shirt is the coolest part of it! I will wear this under a denim jacket for now and on its own in summer with high-waisted denim shorts or a plain skirt. Also how cute is it under my pastel lilac jumper or with dungarees? Grasping the two shirts plus a few more “maybe” items, we joined the extremely long queue for the till. It was about a hundred people long (no joke, it was like queuing for a concert! 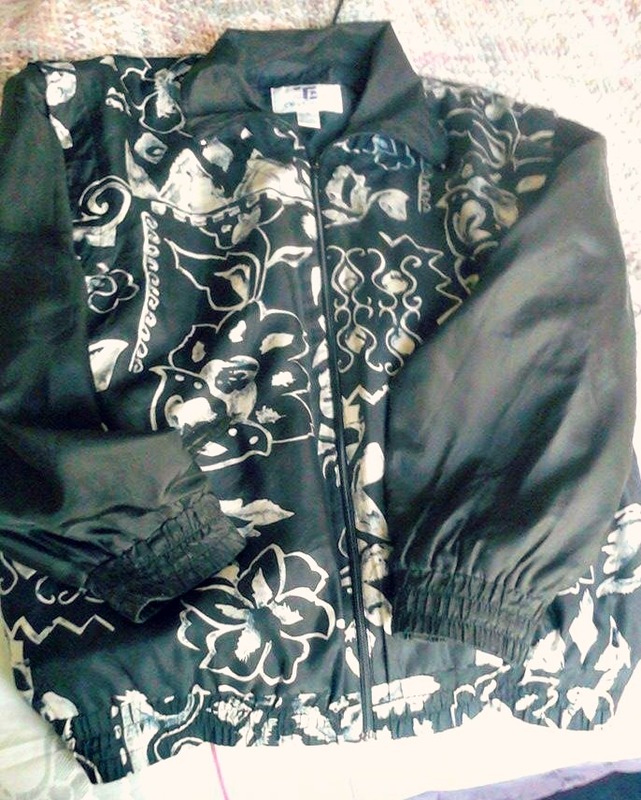 However this turned out to be my saving grace as we were able to peruse items other people had discarded and I picked up a white crochet cardigan and a 90’s patterned bomber jacket. I decided to hang onto these and discard the things I wasn’t sure about. 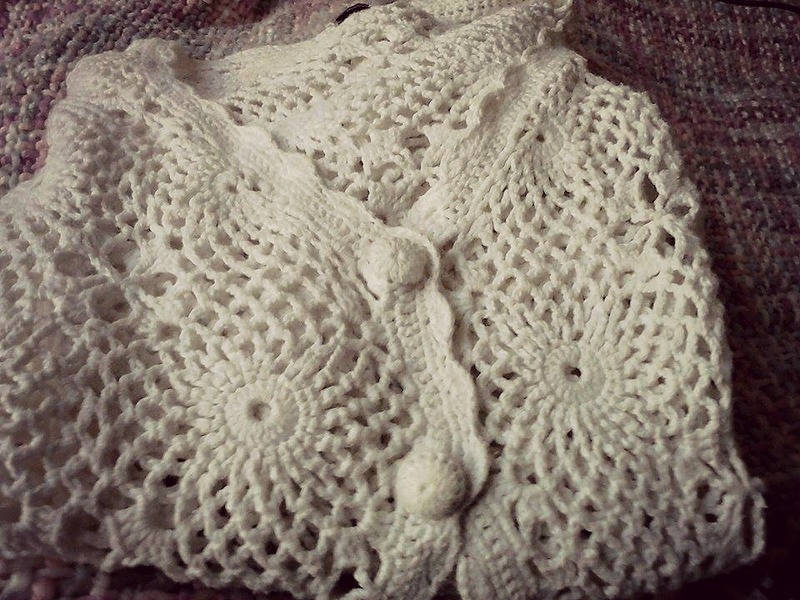 Crochet may be associated with grannies but this would be great with leather look jeans or ripped blue skinny jeans. I’ve been after a bomber jacket forever-so glad I found one. I had been searching for a bright one but this would look great with bold colourful earrings to glam it up. It’s quite big so it’s perfect to wear over a jumper and still be comfortable. When buying clothes I always try them on and scrutinise them in a mirror however in this case I ended up buying 4 items and 3 of them I hadn’t seen on myself! I had to rely my friend’s opinion. As it was a vintage sale, its pretty hard to find your exact size so you have to try on or buy oversized items. I got very lucky with my items and found things that looked good oversized. My items came in just under a kilo at €19 or €4.75 per item.The clothes were priced at €20 per kg for most items and accessories were priced separately. I was delighted with the value and wished there were more things left to buy! Natalie picked up a skirt and two cute handbags which were just €3 each. My only disappointment was that I was unable to find a nice handbag but there’s always next time! I decided not to get too carried away as I didn’t want to end up with a lot of things that didn’t fit. Amazingly my resolve held..many of my fellow shoppers were happy to make up for that! My tips for anyone heading to a kilo sale are bring an honest friend for opinions, a pocket mirror, wear something that’s easy to change, bring a bag if at all possible and be prepared for queuing, crowds and a little bit of madness! As I spent a significant proportion of my adult life working in fashion retail (including working at the Next sale which makes war zones look tranquil) I wasn’t too fazed. There was also a pop-up full price Folkster shop but after the scrimmage we were too tired to look at the full price! I did have a peek around earlier in the morning and saw some gorgeous jewellery. Overall it was a fantastic and fun event for fashion lovers and more importantly accessible to all and well organised. It’s a great opportunity for people to dabble in vintage without spending a lot of money. I have to commend the Folkster team on their hard work, a lot of preparation and planning went into the sale. Half the female population of Dublin was in attendance along with about 75% of the fashion blogger population so I look forward to reading everyone else’s experiences and opinions. Thanks for visiting my blog as always. Don’t forget to check out my Instagram, Twitter and Facebook page here.